If you’re a parent, you’ve no doubt at some point had to master the never-ending onslaught of a “why?” session. Comedian Louis CK has a wonderful bit on this, where he talks about how his daughter’s asking “why” led him to mind-altering insanity as a question about going outside while it’s raining led deeper and deeper into the meaning of life. It’s also one of the most important strategies for content marketing. Let me explain… why. As content marketers, getting to the “why” of our content is central. We are so trained to think in the classic “features and benefits” form of creating, that it can be hard to step back and tell the larger story. And, of course, that’s what we want to achieve with content marketing. Our content marketing should be focused on delivering value to our audiences beyond the product or service we provide. It should ultimately answer the question of “why” our consumers care about us. 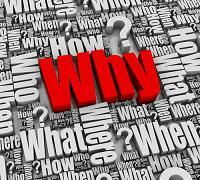 There is a concept in problem solving called the “5 Whys.” It was developed by Sakichi Toyoda and was originally used within Toyota Motors during the evolution of its (now) famous Toyota Production System. It has since been adopted by a number of project management and other processes — namely Six Sigma. Problem: The living room is dark. So, the root cause in this case is that we don’t have a method to track the age of the light bulbs. So, we can’t predict when they will go out, or the greater problem this will eventually lead to (darkness). So, fix the root cause and you can avoid the eventual problem. Now, there are extensions to the 5 Whys, and its weaknesses are well documented. Not to mention that more complex problems can require asking why more than five times. But from a content marketing perspective, an exercise in asking why five (or more) times can provide real benefit. One of the techniques that I use in workshops to go from “tactical idea” to “larger story” is a classic exercise built on the foundation of the “5 Whys.” However, like a kid, I don’t stop at five, but rather go until I get at the larger story that we’re trying to tell. Launch a blog that informs users on how to use the kind of product we sell. Create a white paper series on the business benefits of the kind of service we provide. Use a blog platform to curate news from our industry to position ourselves as thought leaders. Idea: Use a blog platform to curate news from our industry to position us as thought leaders. 1st Why: Why is curating news to position us as thought leaders important to our customers? A: Because our customers will see that we have our fingers on the pulse of our business and have a point of view on the industry. 2nd Why: Why is it important that people see that we have our fingers on the pulse and have a point of view on the industry? A: Because then our customers and prospects will have more trust in what we say. 3rd Why: Why is it important to our customers and prospects to have more trust in what we say? A: Because developments in our industry are changing really quickly and our customers need a trusted partner to keep them on top of what’s going on. 4th Why: Why do our customers need a trusted partner to keep them on top of what’s going on in our industry? A: Because they are really busy trying to be successful and a trusted partner can help them be informed. 5th Why: Why is it important for our customers’ success to be informed? A: Because if they’re informed about the industry from a trusted source, they will be more competitive — and can then be more successful. Pretty cool huh? Within five “whys” we go from a blog that’s focused on “positioning us as thought leaders” to a blog platform that “helps our customers be more competitive and successful.” Go back and read those “why” answers in reverse and you have a pretty well formed mission statement for that blog. Now, if we’re not entirely satisfied with that question, you could continue on this “through our child’s eyes” exercise and ask a few more. For example, “Why is it important that our customers are more competitive?” Each “why” takes a bigger and more important leap toward understanding the larger context of their world. That’s an important point. You’ll notice that in the questioning, I immediately put the emphasis on “why” this is important to the customers. They are the central audience here. It’s not about us. It’s about them. Now, you won’t have an epiphany every single time you do this exercise. And, in many instances you’ll find that the “whys” lead to a “meh” and you can safely abandon the idea. But it’s the process that’s important. Just like with a kid, developing the “whys” helps with the inquisitive mind and helps with learning how to solve problems in a creative way. And, most importantly, it encourages the idea of the joy of discovery. As the wonderful quote from Proust says, “The real voyage of discovery consists not in seeking new lands, but seeing with new eyes.” Asking “why” can certainly open them wider. As always, it’s your story. I dare you go make it remarkable, and then come tell us about it.